The addition of kale is what makes this refreshing smoothie bowl particularly great, not to mention the fact: prep time is less than 15 minutes! With tremendous amounts of Vitamin C and K, it is a great addition to your diet, and when you can include any kind of leafy greens into breakfast, it is always a good thing. And here you can let your imagination roam with all the topping ideas: hemp seeds, flax seeds, shredded coconut, a dollop more of nut butter, a squeeze of fresh lemon juice. Go crazy and have a different variation for every day of the week, and see just how energized your body feels after a smoothie bowl cure. 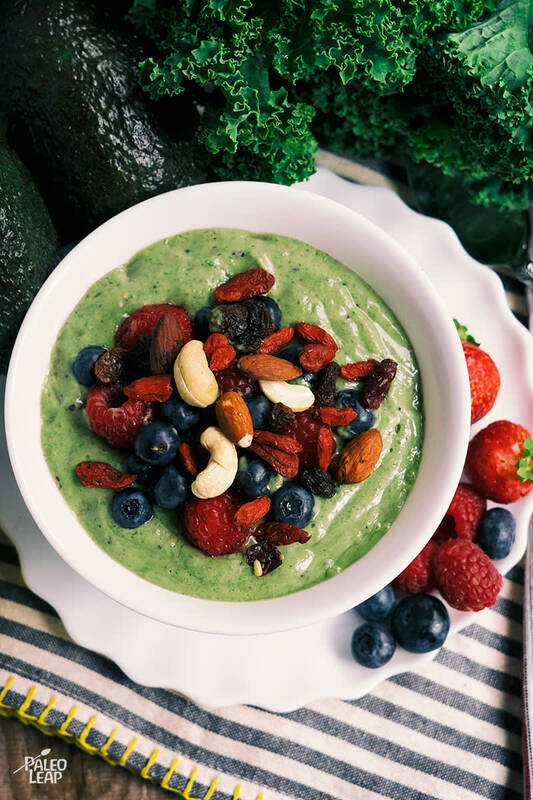 If you are looking for something even more out of the ordinary, a tropical smoothie bowl will surely take your taste buds on a flavor adventure. Place all the ingredients in a blender except the berries and nuts for the topping, and pulse until everything is smooth. If smoothie is too thick add more almond milk, 1/4 cup at a time, and pulsing with each addition. Serve the smoothie in a bowl topped with fresh berries and nuts.